Within Teamwork Projects, you can use the search bar near the top right of your site to quickly find various project items. When using the search bar while viewing an individual project, you will have the additional option of searching only that project. As you are entering a search term into the search box, the quick search will returns results in a dropdown, from project items edited within the last 60 days. If you enter a search term and press return, you will enter the advanced search view, which will show results from any time frame across all projects. You can also access the advanced search by clicking the link in the bottom left of the search dropdown. To search only for a specific project item type, such as milestones, just click the relevant item from the search dropdown. This will add the item type to the search box, and you can then specify your search term. Once you start typing a search term, the dropdown will auto populate relevant results. These results are clickable, and will bring you to the full view for that particular item. 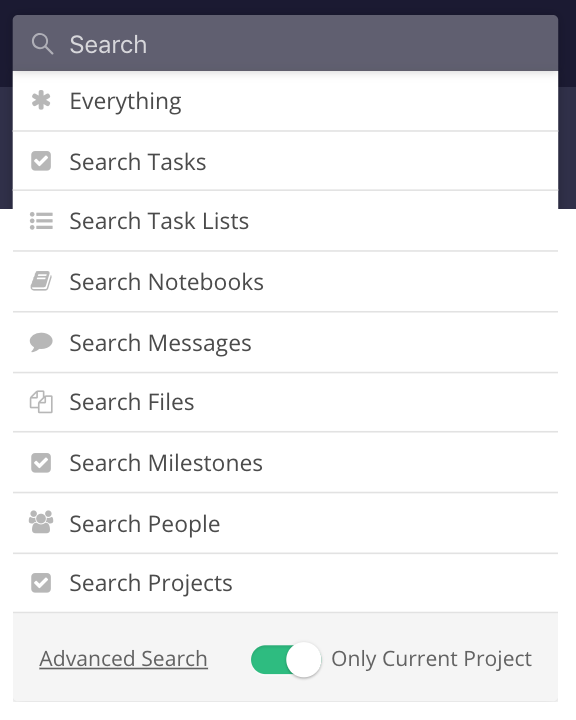 The Advanced Search allows you to search across all projects, or a specific one: a custom set of project items. With the More Options button below the search box, you can search for a custom set of project item types, using the Search For checkboxes. Note: For files, search results include matches from the details of files such as their name and description, however the contents of files aren't included. If you know the ID of a project, task or other item in your site, then you can enter the ID in the search field to see a link straight to that item. You can also run searches for tags in the search bar using #tagname. If you want to search for multiple tags on an item, just enter them in as #Tag1 #Tag2 etc. If the tag is made up of multiple words and has spaces in it, you need to enter the text in square brackets after the hashtag, for it to be returned. You can do advanced search queries using boolean operators such as AND/OR, brackets and quotes around strings to match phrases. You can also search for all items (of all types) with a particular tag by using #tagname in the search field.